The Best Products to Keep Blonde Hair, Blonde! Having blonde hair is a lot of work! I got my hair done the other day and I was talking to my hair stylist about the best products to keep my hair blonde in between appointments. 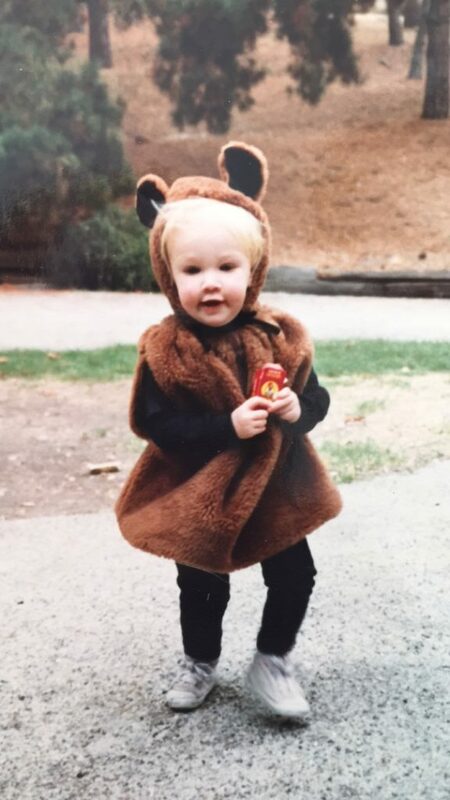 My hair was bright, bright blonde when I was little (see adorable baby pic below… you can’t even see my hair it was so white haha!) and has gone to a more dirty blonde over the years. I didn’t start getting highlights until like… right after college I think *cringe* and holy moly has my hair changed for the better since then! I started going to my hair stylist, Breanna, a few years ago and she has literally transformed my hair. Every time I go in to get my highlights, I just tell her to make my hair white, haha! I obviously don’t expect my hair to actually be WHITE, but we’ve (she’s*) been working for a looong time to get the yellow/brassy tones out of my hair! Bre is known for her blondes, so I completely trust her with my hair. She is also a blonde, so I know that she would never recommend a product or treatment she doesn’t believe in! She could honestly tell me to put just about anything in my hair, and I would follow her lead. Looking for different products on your own can be so overwhelming because there are a lot out there that claim to do this, that and the other thing but don’t really work… and who better to ask than someone who tries tons of products on different clients constantly? I always use my appointments wisely: 50% catching up about life and 50% asking for tips and tricks for myself and to share… it’s all about balance! 🙂 So, I asked Bre to share her favorite products to help tone down yellow/brassy tones, and products to keep your hair healthy and happy between appointments. Here are 5 of her fave products to keep your blonde hair, BLONDE! Pureology Platinum Shampoo & Conditioner: I told Bre I ran out of my L’Oréal shampoo and bought Pantene at Target and she looked like she wanted to slap me… apparently Pantene is one of the worst shampoos to use for blondes! Something in Pantene can react with the bleach for blonde highlights and literally makes your hair smoke. Fun fact, THIS HAS HAPPENED TO ME! I was getting highlights years ago before I went to Bre and my hair actually started SMOKING and my scalp was burning. I had no idea that’s why until Bre told me this could happen! So, long story short, I will be switching to Pureology Platinum which is specifically for blondes. The Pureology Platinum features a zero sulfate strengthening formula that cleanses and softens while maintaining brightness, shine and color on high-lift hair. Sulfate is bad for your hair (and skin!) because it dries it out and strips your natural oils. The Pureology formula gently cleanses hair without stripping color or damaging the hair. Olaplex Deep Conditioner: This is a 3-step process, step 1 and 2 are done in the salon and step 3 is at home. This is a necessity to keep the integrity of your hair, especially while being blonde. Step 1: This step is to re-build broken disulfide bonds. It begins the process of preventing damage and repairing hair. It can be used in your color or added into your deep conditioner. Step 2: This step is used after being shampooed to continue to rebuild and restore any remaining broken bonds ensuring the strongest and healthiest hair possible. Step 3: This step is taken home to use in your monthly routine to provide continuous protection from ongoing damage at home. Pravana: This is a leave in mist for blondes to use on damp hair before you brush to repairs and nourish blonde or highlighted hair. Going blonde or getting highlights can really do a number on your hair. 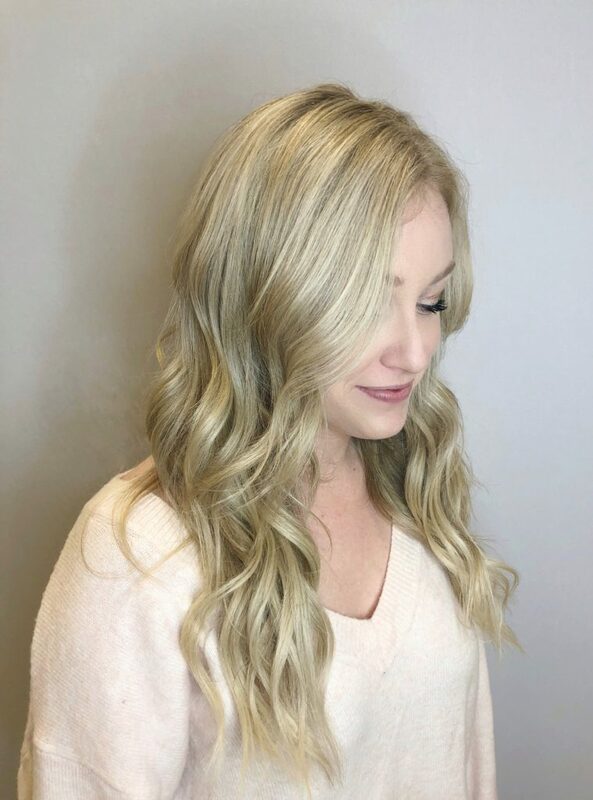 Pravana is a product that provides an instant burst of moisture to hydrate and detangle ends to help minimize breakage, and brighten and protect to enhance the blonde. The two-phase formula perfects color with Chamomile to keep blondes brighter without weighing your hair down. Plus it smells really, really good! Joico Color Balance Purple Shampoo: There’s no formula as to how often you should use purple shampoo but you should definitely be using it if you have blonde hair! I try to use it every other wash but forget occasionally (I only wash my hair twice a week, so once a week) and leave it in for a few minutes while I shave my legs or listen to a song. Purple shampoo uses tone-correcting purple pigments and instantly neutralizes unwanted brassy and yellow tones. It’s like a toner at home! Fanola: If you’re not comfortable using purple shampoo, you can request that your stylist uses Fanola in salon to brighten your blonde. It does the same thing as purple shampoo but it’s a much more intense, fast working product. I was given this by another stylist to try at home and didn’t realize that it was much quicker to work than regular purple shampoo. I left it in for a few minutes like I have my normal purple shampoo in the past and looked down and my hair was literally white and purple after I thought I washed it out! I washed it out 100 more times but it still had a purple hue for a day or two… SO definitely ask your stylist to do this for you! Haha! I hope all my blondes out there found this useful! If you want to shop any of the products I mentioned, you can in the widget below. What products do you love to keep your hair healthy? Leave me a comment and let me know! Thank you to Bre for collaborating with me on this post, always making my hair healthier than when I came in and not yelling at me when I use bad products! You can follow Breanna on Instagram, @hairbybreannaguerrero.